Hedge fund legend Julian Robertson, chairman of Tiger Management, and David Roche, of Independent Strategy, discuss the best ways to fix the banking mess on CNBC. Finally some smart people on Wall Street. Obama and his administration along with other government officials need to quit discussing the plans and get on with them. The only way to solve this problem is to get the toxic assets off the balance sheet at market prices. In theory, as the market opens up the prices would move towards a more real level then the current overly depressed levels. Other buyers would join in with the government. These banks wouldn't be forced to sell, but it would give them a way to clear these assets from their balance sheets so that they could move forward. RIGL stock is down 8% now after a big downgrade from RBC. Still haven't found the info, but its amazing that after all this time and access to information that analysts can have such a huge impact on a stock. So far RIGL is holding the support that has existed in January and it's bounced up since the opening. Positive signs that buyers were happy with this price. Might turn out to be the typical contraian play. Ah, the analysts play such games. Not a huge shock considering the bankruptcy filing by Nortel (NT) a while back. After hours last night Alvarion (ALVR) issued a PR detailing the break and the financail impact. It's disappointing because ALVR had hoped to use the scale of NT to allow them into bigger deals, but this cancellation doesn't end the dominance of ALVR in the Wimax market. Guess we'll find out more details from the breakup on the Q4 call. With ALVR trading near cash now, the stock is a huge buy. NT had hardly become a big part of the business and won't leave a huge wake when they leave. Rigel (RIGL) is an intriguing biotech stock. It has the potential for a blockbuster drug in RA and the biotech sector is compelling with the big pharma companies on the prowl. PFE would've been wiser to buy up somebody like Rigel (RIGL) or some other favorites like Onyxx Pharma (ONXX) or Savient (SVNT). If you want to develop a pipeline, then why not buy all 3 and get access to several potential blockbusters. Regardless, these companies are solid without them. Not being a biotech expert, check out this story on Rigel from Hammer Stock. The news surrounding Home Sales continue to improve. Existing home sales rose unexpectedly in December. As we've reported in the past, home sales in areas such as California have been increasing at a dramatic rate. This is whats needed to stem the bleeding. Prices have finally gotten low enough to increase demand. Combine that with fewer houses being built and we'll soon enough work off the inventory. So the negative is the record drop to housing prices to $175K, but at the same time the inventory dropping to 9 months is very encouraging that the housing market is about to reach equilibrium. 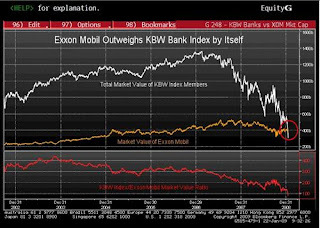 Exxon is now worth more then all of the Financials in the KBW Bank Index. Is Exxon Mobil Corp. really more valuable than Bank of America Corp., Citigroup Inc., JPMorgan Chase & Co. and 21 more of the largest U.S. financial companies combined? Yes, according to stock investors. The CHART OF THE DAY shows the total market capitalization of the KBW Bank Index’s two dozen stocks dropped below the value of Exxon Mobil, the world’s largest oil company, during the past week, according to data compiled by Bloomberg. . . . Companies in the KBW index have lost about $1 trillion in market value since February 2007, when it climbed to a record 121.06. Apple (AAPL) continues to be one of our favorite stocks. After the bell last night they reported numbers that beat analyst estimates by $.40. Thats an incredible number during a very weak environment. What impresses us the most is that they generated $3.6B in cash and now have over $28B on the balance sheet. Apple could open a bank with that cash. Plenty of news on Apple on the net so I'll keep this short. I'd be a big buyer at the current qoutes below $90. Incredible value! Riverbed (RVBD) announced after the bell last night that they would easily exceed Q4 estimates. Very impressive considering the environment. Even more impressive their revenue was up 20% as compared to last year. Like another of our favorites FCStone (FCSX), it's very impressive when a company can still grow in this environment. These stocks should rally strong when the market turns around. RVBD focuses on WAN optimization which helps workers be more productive and reduces costs. All important concepts when every company is laying off employees left and right. Future oil contracts continue to trade at extreme prices compared to the current month. Check out Nymex Oil for up to date prices. Most of the media focuses on the current contract trading in the 30s, but the long term plans in the energy market are more based on future contracts. Companies can already lock in prices in the $60s and $70s. If anything, the current weakness in the markets will ensure that we reach these future prices. It's just starting to look like the perfect setup. The markets have been in a downward spiral since Oct '07 - 16 months. The economy has been in a recession for 14 months (counting January already). The media is very pro Obama and has been anti-Bush. Wouldn't it just be a great story if the markets rallied on Obama's inauguration. Wouldn't the media just love it. From a technical standpoint, the markets had a perfect setup last week. On Thursday, the S&P had a reversal at 820. Basically the low of this market except for the brief 2 day drop below 800 and dramatic snap back. Then on Friday, the S&P closed over 850 which a lot of technical traders consider the low of the trading range. Otherwise, buy at 850 and sell when the market reaches 920-940. Currently the 50 day EMA is at 904 so a move above this level would also encourage buying. Maybe it's the fact that FCStone (FCSX) kinda rhymes with Stone Fox that we've liked this stock since it's IPO. Or maybe the fact that they are a commodity risk management company that came public during the great commodity boom. FCSX has generally reported strong results since that IPO but the stock is substantially lower now. Whether because of the credit crisis and counter party risks or bad debt exposure to clients, FCSX was hit extremely hard in 2008. The once highflying stock dropped from $53 all the way to $1.90. Sounds like a stock with huge growth problems, but the market might be surprised to learn that revenue grew by 16% last quarter YoY. Now how could a stock drop 96% yet still grow revenues? The only answer is FEAR. The Hedged Growth Portfolio started in Oct 2008 was actually able to end the year at $1,003,451 for a gain for $3,451. Not bad considering how bad the environment was in Q4 of 2008. The S&P500 was down 22% during that period. Alot of the reason for the outperformance is that the fund is designed with up to 1/3 of the portfolio in short positions. Using the UltraShort Real Estate ETF (SRS), the portfolio was able to offset some of the losses in the 2/3s long positions. Unfortunately though, its been well documented of late that these Ultrashort ETFs aren't good for long term investments and the remaining position in SRS and the original position in the Ultrashort Oil & Gas ETF (DUG) have provided negative returns. In fact the position in DUG is now down 44% proving you can have the right thesis but the wrong vehicle and still lose money in this market. According to Carter Worth on Fast Money's 12/29 show, the gold stocks are set up to test a huge long term declining trend line. After a 100% gain off the bottom, gold stocks such as Goldcorp (GG) are set up for pretty entriguing shorts. During this time gold is only up 25%. This report by Carter intriqued me because alot of infrastructure/commodity stocks are up way too much on back of the 'expected' Obama plan. These seem as good shorts as any. Today's decline in the face of a 3%+ market rally adds to the appeal. Any breakout above $33 for GG should be covered. Not to surprising to see this report on manufacturing. Just reaching lows not seen since 1980 is actually either encouraging or signs that this sector has farthur to fall. When stock losses are the worse since 1931, 1980 isn't all that bad. The early 70s recession along with 1980 had worst readings so maybe we should expect a pretty bad January or February numbers as well. Though 32 on this report is pretty horrific. The market has taken this report in stride though. Starting to be encouraging to see the market rally with such weak economic reports. A-Power (APWR) posts what has to be one of the worst warnings I've ever seen. They wait until nearly the last day of the Q to issue a release saying that revenue will be 50% less then expected. This from a company that still have a lot of believers thinking they were isolated from issues and might possibly make the Qs numbers. In reality, the reported numbers aren't that bad compared to the stock price, but whats really confounding is the reasoning. What contracts were postponed? And which ones could've generated $80M in revenue by being signed during the last week of the quarter? Potentially some of the wind customers could generate that level of revenue because the power customers couldn't just be counted as revenue until parts of the project are completed.